I’d never really thought of myself as 'different'. It only hit me when I was sitting in a room with 150 other civil servants listening to a Permanent Secretary talk about how to meet the challenges of the future. He said the Civil Service needs to champion difference. How being different was something to celebrate and something of value. In his eyes, the people there were the future leaders, the ones who could bring a different point of view and fresh new ideas. 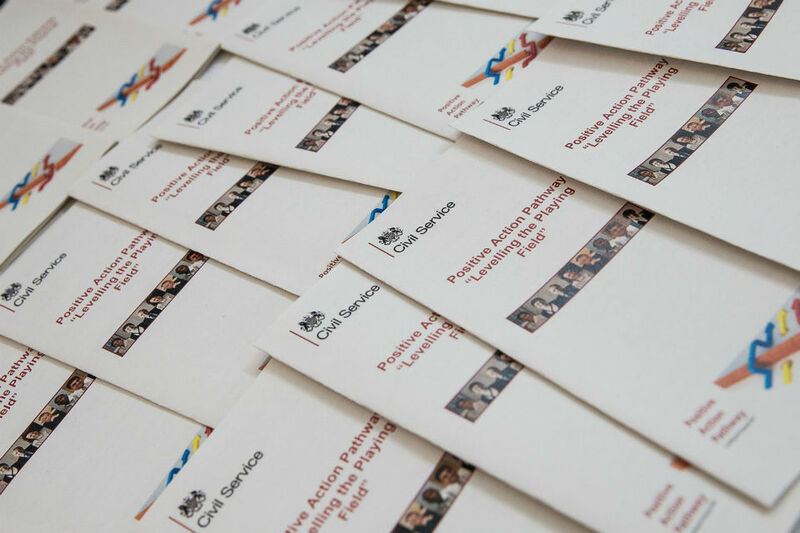 I was at the launch event for the HEO/SEO Positive Action Pathway, a Civil Service development programme for under-represented groups. Its tagline is ‘Levelling the playing field’. The idea is to give different people more confidence to progress and develop, and hopefully show we can be positive role models for others too. In my time at the Vehicle & Operator Services Agency and then the Driver & Vehicle Standards Agency, I’ve stepped up from EO to HEO and then SEO level. I've enjoyed lots of development along the way, such as an opportunity-of-a-lifetime secondment working at the Olympics. The next step up, to Grade 7, seems a big leap, however. So, last year, I started to think about where I needed to develop my skills if I wanted to progress. I’m not different, am I? I heard about the programme and my first thought was, ‘”But I’m not different, am I?” I felt uncomfortable about being defined as a woman, when first and foremost I am just me. After a lot of thought though, I figured it was a good opportunity to test myself. I had to do a range of (very scary) online maths, reasoning and psychometric tests, followed by a competency-based application using competencies from the level above mine. Just working through all that seemed like a big achievement, but I was amazed to discover I had got through and was offered a place on the programme. Over 1,000 people applied for 180 places, so I know being accepted isn’t a tick-box exercise. After meeting the other participants back in December, we’ve been on a really interesting journey together. The pathway is a mix of traditional face-to-face learning and other development activities, such as action learning sets, mentoring and work-based projects. The focus is definitely more on what we do outside the formal courses. All the time, we’ve been encouraged to think about what we can apply back at work or at home. I’ve been fortunate to have a great mentor at the Cabinet Office. She has shared lots of her experiences and life lessons with me. She’s encouraged me to learn more about the bigger picture of what’s happening in the Civil Service. I’ve also learned a lot more about myself, through a variety of personality and psychometric assessments. These have made me realise more about why I am different, and how that shapes me. They have really helped me to identify what drives me at work, how my personal beliefs and motivations affect my behaviour and how I come across to others. Learning about this has helped me to build my confidence, and to have the courage to put myself in scary situations, to see how I cope. For example, next month I am going to facilitate at an event for the Top 200 Leaders of the Civil Service. Aagh! I am extremely nervous, but also relishing the chance to observe our top leaders and learn from them. The part I’ve most enjoyed is meeting people from around the Civil Service, sharing our experiences and supporting each other as we push through our comfort zones. Our group mantra is ‘subvert the bias’ – in other words, to change the system from within, by showing why being different can help the Civil Service become stronger. 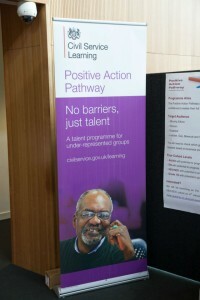 I went along to a Talent Action Plan event after reading Richard Heaton’s blog. I heard some really inspiring stories about difference. We were all asked to make a pledge about what we’d personally do to champion difference. I pledged to fly the flag for the pathway! That’s why I’m writing about my story now. I’m nearing the end of my pathway programme now. So I wanted to share a few tips with anyone wondering if this is for them. First – the application process is seriously hard. It’s like applying for a promotion, so prepare yourself. Have a go at the sample tests, think long and hard about your competencies and ask someone you trust to give you feedback on them. Second – you’ll only get out what you put in. I’ve learned that the training, the assessments and the opportunities will start you on your way, but they won’t change anything unless you take a leap and try out some scary things. Third – talk to your manager about how you will manage the time away from the office/test centre/ATF, etc. The dates for the whole pathway are set in advance, which helps with planning. How will you show that time away being developed has been worthwhile? Think about how you will share your learning with your manager.